The government of Canada allows Canadian citizens or permanent residents to sponsor their spouse to Canada. However, the Canadian government has set many strict rules to regulate potential immigrants, in order to ensure those who are immigrating to Canada will not pose any risks to Canadian citizens and permanent residents. One of the rules revolves around mistakes on your application. If you make mistakes on your application, regardless of your intentions, your application can potentially be returned or refused. 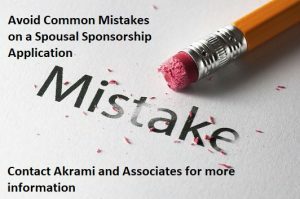 In this blog, you will learn relevant information about common mistakes applicants make on their spousal sponsorship application, so that you may avoid them on your own application. When you are applying for Spousal Sponsorship, providing false, irrelevant, or incomplete answers on the forms is probably the most common mistake to make. Your application can be returned or even refused due to irrelevant, incorrect, or incomplete answers on the forms. If you are not sure of the meaning of a question, we highly recommend you to professional help and guidance. Often times, sponsors and the principal applicants will leave “blank spaces” on sections they think they are unable to answer, or on sections that are not applicable to their own situations. From an immigration officer’s point of view, omitting information can be very suspicious, and therefore, it can affect your application process negatively. A good way to avoid such mistake is putting “Not Applicable” or “N/A” on the section instead of leaving it empty. If your goal is to sponsor your spouse to immigrate to Canada, then you have to make sure you are applying under the Family Class stream to become a permanent resident in Canada. It may sound ridiculous, but Immigration, Refugees, and Citizenship Canada (IRCC) treats their applications forms very seriously. The Immigration, Refugees, and Citizenship Canada updates the applications forms several times a year to obtain more information of the applicants. For this reason, having the newest version of forms is extremely important. If you fail to submit the newest version of the forms, your application might be returned and will have to fill the forms all over again. Immigration terminology can be confusing, especially for foreigners who are not familiar with Immigration, Refugees, and Citizenship Canada (IRCC). When talking about sponsorship application, the “sponsor” is the Canadian citizen or permanent resident that wants to bring their spouse or common-law partner into Canada. On the other hand, the “principal applicant” is the one that intends to immigrate to Canada and live here as a permanent resident. The sponsor and the principal applicant must fill out separate forms. It is therefore important for both the sponsor and the principal applicant to understand their own role. If the form is filled by the wrong person, it will indeed be returned. In order for the immigration officer to examine whether or not the relationship or the marriage is genuine, the sponsor and the principal applicant need to provide accurate and adequate supporting document. Typically, the supporting documents demonstrate personal interaction between the couple. For example, photos, greeting cards, text messages, receipts of money transfers between the sponsor and the applicant, travel itineraries, social media interactions or status, emails, letters, phone records, and many more. In terms of evidence of your relationship, you must never send inappropriate pictures to Immigration, Refugees, and Citizenship Canada. In addition, if you do not submit enough supporting documents, your application can be returned or even refused. Even though you do not intentionally provide false information on the forms, you can still be accused of “misrepresentaion.” Misrepresentation is a federal crime, and you may face severe consequences for committing such crime. For example, Immigration, Refugees, and Citizenship Canada can ban the principal applicant from entering Canada for at least five years, take away your status as a permanent resident or Canadian citizen, have you charged with a crime, remove you from Canada, and so on. It is your responsibility to submit a spousal sponsorship application that has truthful information. Sponsoring your spouse/common-law partner/conjugal partner, dependent children, or other eligible relatives can help your family reunite in Canada. You may also enrich their lives by giving them a chance to live and prosper in a country that is culturally diverse and welcoming. Help. Furthermore, Canada may gain productive permanent residents to help contribute to the Canadian economy. However, applying for sponsorships can be very confusing and overwhelming, as there are different types of requirements that you would need to meet. It is important for you to pay close attention to every detail during your application process. The failure to do so could result in application refusal. Ultimately, it could make you ineligible to sponsor any individual in the future, or make you inadmissible to Canada if you are the principle applicant. Therefore, it is highly recommended that you seek professional help. Akrami & Associates work and have experience with many different immigration issues. We have helped many of our clients obtain permanent residency in Canada through the different types of sponsorship. If you have any questions regarding sponsorship applications, or if you would like to book a consultation with an immigration professional for more advice, please feel free to contact Akrami & Associates at 416-477-2545.